We are a non-profit organization dedicated to making your holiday season enjoyable. The association is governed by an Executive Board and Board of Directors, with 3 members representing each of the three main areas. Check the Meetings page for times and places. Guests and those interested in joining are welcome to attend. 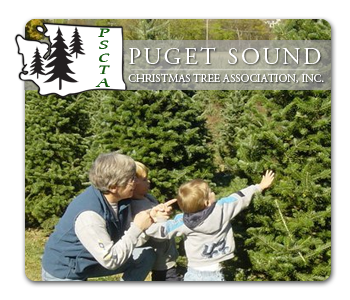 Here at our site you can locate a Choose & Cut tree farm in your area by clicking on the Puget Sound map near your town. Map information is updated in October each year. Most of the farms listed offer u-cut and fresh cut Christmas trees, tree baling or netting, and personal assistance in choosing your tree. Some farms also provide shelter with complimentary hot chocolate, cider and candy canes. Tall, flocked or living trees, delivery, Santa or Mrs. Claus, petting zoos, picnic areas, u-dig fire pits, table tops, hay rides and bake sale cookies are also offered at various farms. Check the individual listings for more information.